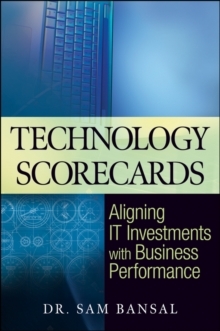 Insider advice on establishing Key Performance Indicators to value technology investments and achieve business performance Featuring discussion of methodology that firmly establishes KPIs based on business objectives, benchmarks them, and prepares a scorecard that is used to derive the value that can be unleashed if the value drivers are established, Technology Scorecards reveals how this approach benefits both the organization and technology vendors as it helps establish achievable expectations. In addition, it offers relevant discussion on how to integrate people, information, business processes, and technology, going beyond the simple project management or the deliver on promise slogans of technology vendors. Dr. Sam Bansal (La Jolla, CA) has years of experience in the enterprise software industry, primarily focused in Consulting. He is head of SIS & Partner of Elixir Netcom Solutions, a technology solutions provider.